315 Lindsey Street  Reidsville, N.C. The main entrance to the church is from the narthex, which is an antechamber to the sanctuary where services are held. Upon entering the sanctuary, the eye is immediately drawn to the altar area, above which are three stained glass windows depicting Jesus, Thomas and Mark. The altar itself is covered with a cloth and decorated with candles and flowers, symbolizing the light and resurrection of Christ. A cross is on the wall above the altar, and beneath the stained glass windows. During the Eucharist (Holy Communion), the bread and wine are consecrated at the altar. Facing the altar, the pulpit is to the right. Sermons are preached from the pulpit. To the left is a lectern, from which the lessons are read and the prayers of the people are led by a lay reader. The baptismal font is in front of the pulpit. It is moved to the center of the main aisle for services of baptism. The principal service at St. Thomas is the Holy Eucharist (Holy Communion). There are two services each Sunday. The 8:30 a.m. service is a spoken service, meaning there is no music. Typically, Rite I, having the older, more traditional language, is used at this service. The 11:00 a.m. service is a full choral service. On high Holy Days, parts of the service of this liturgy may be sung. At the 11:00 a.m. service Rite II, having more modern language, is used, except during the penitential seasons of Advent and Lent. Each of these services follow the same basic format, using prescribed readings from the Bible, a sermon, affirmation of faith, prayers of the people, confession of sins, exchange of the peace, and communion. Our communion rail is open and anyone, regardless of denomination, is welcome to take communion. Bread used during communion is baked by members of the parish. Wine is used. Visitors and newcomers can be assured that you will not be singled out or have unwanted attention focused on you by having you stand or come forward during the service. Although the service is led by the priest, members of the congregation actively participate. Some of the scriptures are read by lay readers (the Gospel lesson is read by clergy) and laymen assist in communion by administering the chalice, or cup, containing the wine. Communicants may either eat the bread separately, and drink from the chalice, or may dip the bread into the wine and then consume it (known as �intinction?. People in the congregation participate in the prayers. Each pew is equipped with three books. The Book of Common Prayer (red) is used nationwide by Episcopal churches. It contains the text for all the spoken parts of the service. We regularly use the psalms, the Nicene Creed (the Apostle�s Creed is used at Morning Prayer), the Lord�s Prayer, the prayers of the people, the confession, and the Holy Communion. 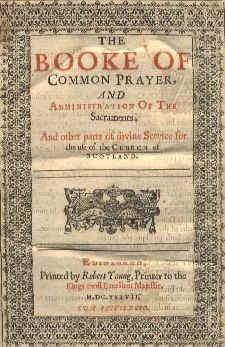 The Book of Common Prayer also contains text for special services such as baptisms, weddings, funerals, dedications, and so on. The service text is printed in standard print and directions to the clergy and congregation (�rubrics? are printed in italic. The 1982 Episcopal Hymnal (blue) is the official hymnal of the Episcopal Church. It contains text and music for the sung portions of the service. Also in each pew is another hymnal, �Wonder, Love and Praise,? (green, soft cover) which contains additional hymns and music. During the Eucharistic service you will hear one reading from the Old Testament, one from the New Testament, and one from the Gospels. During Advent, Christmas, Lent, and Easter, the readings are selected to match the season. During the rest of the year, the Old and New Testament readings are matched with the reading from the Gospels. First time visitors to St. Thomas need not be taken aback by the standing and kneeling during the service. Episcopalians typically sit to listen, stand to sing, and kneel or stand to pray. Kneeling for prayer is an expression of humility in the face of God�s love. However, whether one stands, sits or kneels can vary from one person to another. No one is expected stand or kneel if to do so would cause discomfort. Some people will genuflect toward the cross in the aisle before entering to sit or upon leaving to approach the communion rail. This is entirely a matter of choice and is optional, as is making the sign of the cross at certain times during the service. Children are a vital part of our services and are always welcome. Many parents prefer to have their children sit with them during the entire service, while others prefer that their children remain in the nursery or parish hall. Older children (over two years of age) who remain in the parish hall for activities are brought to the sanctuary for communion. The form and content of our services are largely determined by the liturgical season of the traditional Church calendar. The year begins with Advent, the season of preparation for the birth of Jesus Christ (Christmas). Advent begins on the Sunday closest to November 30. It is followed by Christmas on December 25 and lasting for twelve days, after which we celebrate the feast of Epiphany (January 6). Epiphany is followed by Lent, the forty day period just before Easter, when we reflect on our relationship with God and prepare spiritually for the crucifixion of Christ. Lent begins with Ash Wednesday. Easter is a happier season, in which we celebrate the resurrection and the promise of eternal salvation. Easter lasts for 50 days and concludes with the feast of Pentecost, marking the birth of the Christian church. Clergy and other liturgical leaders wear special garments, called �vestments,?signifying their ministries. These are often made with colorful and decorated fabrics and serve to enhance the beauty and majesty of our worship services. The colors worn by the clergy are changed in accordance with the liturgical season. Some special vestments are worn on holy days and special feast days. The colors for the liturgical seasons at St. Thomas are: Advent (purple), Christmas (white), Epiphany (green), Lent (purple), Easter (white), and Pentecost (green). On the first Sunday of Pentecost red is used. White is used on the second Sunday of Epiphany, celebrating the Baptism of Jesus. The cassock: this is a full-length undergown, usually black or red, worn by choir members and clergy. 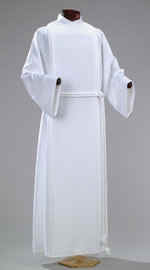 The surplice: this is a gathered, half-length, white overgown worn over the cassock. The alb: a white, full-length, long-sleeved tunic. The stole: a band of colored fabric worn by ordained clergy on top of the cassock, alb, or surplice. Priests and bishops wear the stole around their necks, with the loose ends hanging down in front. Deacons wear the stole over one shoulder, with the loose ends fixed at the waist. The chasuble: a circular, shawl-like garment worn by a priest or bishop over the alb or stole. The dalmatic: this is a version of a chasuble worn by deacons. The mitre: this is tall, stiff headpiece worn only by bishops.